We have reached our limit for participants! Please email us to be added to our contact list for updates on future digs. 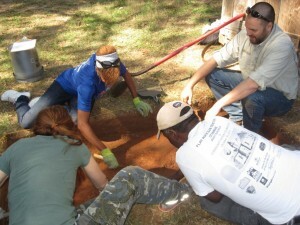 You can help archaeologists on an exciting journey in search of clues to the history of an all but forgotten community. These excavations are open to the public. We are asking community members to come out and join us in digging up some local history. No previous experience is necessary and the general public, amateur historians, and the descendants of the people who lived on the Lyon Farm are all welcome to participate. All participants will be trained on location to properly search for artifacts and all necessary equipment will be provided. What is the Lyon Farm? The Lyon Farm was settled around 1800 by a Revolutionary War soldier on land that was originally part of the Creek Nation. It remained a self-sustaining farm throughout this time and was one of the four plantations that served as the cornerstones for the Flat Rock community. As a working farm for generations, there is a high likelihood of finding interesting clues about past residents and early American lifestyles. 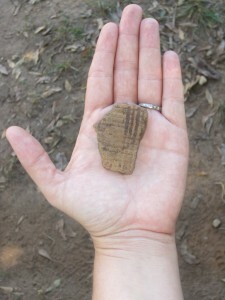 Creek settlements were also reported in the area and there is a good chance of encountering Native American artifacts during the investigations. A site, properly excavated, tells you about the people who lived there, what they believed, and how they organized their society. This is a rare opportunity for the public to become engaged with and involved in the interpretation and understanding of the past. This project could also have a lasting impact on our community’s values, sense of place, and the future preservation and management of our historical areas.